During March of 2012 a resident of the community of Kokhonok, located on the southern shore of Iliamna Lake at the base of the Alaska Peninsula, described for me his traditional freshwater seal hunting practice. Traveling along thick ice by snowmachine, the hunter pulls in along a frozen beach, dismounts, and climbs through the spruce forest to the top of a large hill overlooking the lake. Utilizing the high point as an advantage the hunter glasses the frozen lake for pressure cracks in the spring ice. The hunter searches for freshwater seals sunning themselves on the open ice. Patiently he waits, intermittently glassing the ice. Eventually a pack of seals emerges along the side of a pressure crack approximately a half mile from the shore. The hunter packs up his gear and descends the hill. The hunter uses the snowmachine to get within a few hundred yards of the seals and then travels by foot, slowly and silently. The hunter comes within his desired range, a range which allows him a clean shot to the seal’s head, aligns the crosshairs in the scope of his rifle onto his target and fires. Bang; the seals scatter, splashing into the watery gap of the pressure crack. One of the seals remains, motionless on a now crimson red patch of ice. The hunter retrieves his snowmachine and loads the harvested seal onto a haul sled. Returning to Kokhanok friends and relatives arrive to assist with processing the freshly harvested seal and to receive a share of the meat and fat. The fat is used to make seal oil, an important traditional subsistence food for residents of Kohanok and the other lake communities of Iliamna, Newhalen, Pedro Bay, and Igiugig. At 1,600 sq. mi (2,590 sq. km), 77 mi (124 km) long, up to 22 mi (35 km) wide, and up to 984 ft. deep (300 m), Iliamna Lake is Alaska’s largest body of freshwater. Many rivers and streams drain into Iliamna Lake. The Kvichak River drains the lake southwest into Bristol Bay. Iliamna Lake and its tributaries are critical spawning grounds for Chinook, coho, and sockeye salmon. The lake also supports several populations of freshwater fish. Although residents of these communities have never excessively harvested the unique seals resident to the lake, they explain that every year for as long as anyone can remember and as long back as their passed on elders could remember, the people of Iliamna Lake have always hunted seals, usually only taking three to five per year for supplemental meat and mainly for seal oil. Seal oil is used as a flavorsome and nutritious condiment for dipping salmon strips, fish eggs, and moose or caribou dry meat. While it remains unclear how long the seals have been in Iliamna Lake, how they ended up there, and if they are even permanent residents, it is likely that the people of Iliamna Lake, Yup’ik, Alutiiq, and Athabascan, have been hunting seals there for multiple generations. A Kokhanok hunter carries a seal harvested from Iliamna Lake to a location for processing. Photo: Rebecca Mike, Kokhanok. “…we said farewell to the Indians and set out on the return journey to Lake Iliamna…Toward evening we came upon our baydarkas, got into them, and set out along the [Newhalen River] to the lake. Patyukov killed a harbor seal. We went ashore, pitched our tent, and settled down for the night”. Seals inhabiting bodies of freshwater are rare. Iliamna Lake freshwater seals make up one population of only five in the northern hemisphere; Lake Baikal and Lake Lagoda in Russia, Lake Saimaa in Finland, and Lac de Loups in Canada. While the seals inhabiting Iliamna Lake are believed to be harbor seals (Phoca vitulina) exact species identification remains uncertain. It is also possible that Iliamna seals are spotted seals (Phoca largha), or hybrids of each. Much else about Iliamna Lake seals remains a mystery. While it is known that some seals inhabit the lake year round, researchers are unsure if the seals travel in and out of the lake along the Kvichak River. Even though access to saltwater in Bristol Bay is possible, there are no known accounts of seal migration. While seal pups have been seen in the lake by both researchers and local residents, the extent to which seals breed and rear their young in the lake remains unknown. Additionally, the number of annual seal harvests per community is also not thoroughly understood. Since 2009 David Withrow of NOAA’s National Marine Mammal Laboratory has been working alongside Dr. Jennifer Burns, professor of Biological Sciences at the University of Alaska Anchorage, conducting aerial surveys in an attempt to obtain baseline data about the Iliamna Lake seal population. Although from 1984-2008 periodic aerial surveys of Iliamna Lake seals were conducted by ADF&G and later the National Marine Fisheries Service, data from these surveys was limited because they only occurred during the late August molt period. Beginning in 2009, Withrow and Burns began conducting surveys in spring, summer and fall, in an attempt to understand seasonal fluctuations in seal numbers. Over the 28 years of aerial surveys, counts have ranged from zero to more than 300 seals, with the largest numbers occurring during August. In 2009 Withrow and Burns documented the presence of seals in winter and in 2010 the presence of seal pups during the summer. Funded by the North Pacific Research Board, the partnership also includes the Bristol Bay Native and Association (BBNA) and more recently, ADF&G Division of Subsistence. Concern from local communities about a lack of information on the seals initiated an effort to better contextualize the growing scientific knowledge with local knowledge about the seals. Beginning in 2009 local research assistants (LRAs) began conducting household surveys to collect seal harvest and use data in the communities of Iliamna, Newhalen, and Kokhanok. Efforts were also made to collect local traditional knowledge (LTK) data on seasonal patterns and shifts in seal abundance through ethnographic interviews and mapping and to collect tissue samples from local hunters. This effort continued into 2010 and beginning in 2011 was expanded to include the communities of Igiugig and Levelock. From early winter 2011 to spring 2012 ADF&G Division of Subsistence and UAA researchers, alongside LRAs from each community, have been conducting systematic harvest surveys and (LTK) interviews in all five of the participating communities. Aerial surveys and bio-sampling will also continue during 2012. 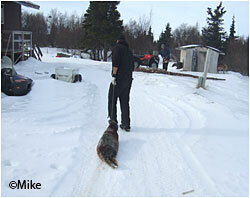 A Kokhanok hunter processes fat from a seal harvested at Iliamna Lake. Photo: Rebecca Mike, Kokhanok. Preliminary results of this ongoing interdisciplinary research project yield different, but mostly complementary, data sets about seal ecology. First, both aerial surveys and local interviews indicate that seals are in the lake all year and that pups are born in the lake. Second, aerial surveys revealed large increases in seal numbers in late summer and thus suggest that some seals do not overwinter in the lake and instead migrate to Bristol Bay. However, LTK interviews suggest that there is no seal migration from Bristol Bay and that the seals are permanent, only becoming more visible during late summer when salmon runs occur. Most locals believe that overwintering occurs in a northeastern area of the lake. Overwintering locations remain a mystery, but several local respondents suggest the existence of an underground rookery in the form of a cave which allows access to the lake’s frozen waters while providing shelter for the seals. 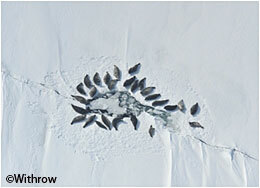 Overall, in regards to seal habitat for feeding and haul out sites, aerial survey and LTK mapping results agree that seals spend most of their time in and around the island systems of the northeast portion of the lake and during salmon season feed near the mouths of the lake’s tributary rivers and streams. According to LTK interviews, lake seals are larger and fatter than freshwater seals and many locals speculate that this is because of a diet rich in salmon. Locals also suggest that freshwater seal fur is softer and thicker than that of saltwater seals. Genetic analysis of one tissue sample has indicated that the seals are harbor seals but much more sampling needs to be done to make a determination. Harvest surveys have also provided understanding of seal harvest amounts and lean towards a preliminary estimate of 3-5 seals per community per year. James Van Lanen is a Subsistence Resource Specialist for ADF&G Division of Subsistence, currently based in Anchorage. Russian Exploration in Southwest Alaska: The Travel Journals of (1818) and Ivan Ya, Vasilev (1829). Ed. James W. VanStone.